The current Audi Q7 is overdue a refresh. The, so the premium SUV is definitely due an update. It appears the Q7 will soon be getting a facelift, as our spies have spotted a prototype undergoing testing. The biggest changes can be found at the front, where the updated Q7 features slimmer headlights akin to the , as well as a wider grille and a redesigned front bumper. These styling changes are welcome, bringing the Q7 up to date with Audi’s modern line-up. 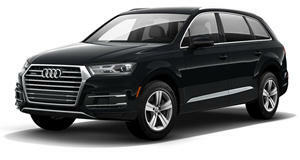 In particular, the new Singleframe grille gives the Q7 a sportier look . More changes can be found at the rear, as the prototype sports slimmer taillights with new graphics, and the lower part of the rear hatch also looks radically different to the current model. The lower parts of the rear bumper have also been redesigned. As for the interior, the dashboard inside the prototype is covered up, so there could be some big changes coming. Having said that, it seems unlikely that Audi will completely redesign the interior to look like the flagship Q8. Instead, the updated Q7 is likely to gain a new steering wheel, minor trim and material changes, and an updated infotainment system. In terms of engine options, we’re expecting the updated Q7’s powertrain to be more fuel efficient, but specific details are being kept under wraps. In the US, the current Audi Q7 is offered with a choice of a 2.0-liter turbo I4 generating 252 hp and 273 lb-ft of torque or a 3.0-liter supercharged V6 that produces 333 hp and 325 lb-ft of torque. Expect Audi to lift the wraps off the refreshed Q7 sometime next year.